OUR FIRST BOOK CLUB OF THE YEAR IS THIS MONTH! 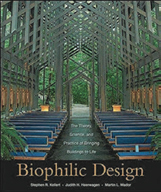 Join us for a deeper dive into the fascinating world of Biophilia. We will be discussing the second part of the book that we started to read last year. by Stephen R. Kellert, Judith Heerwagen, and Martin Mador.